More milk went along in a Thermos Funtainer (Spiderman , in case you are wondering, though we also have two Batmans and a Hello Kitty ...). Ethan reported that it was still "cold as ice" at lunchtime. I keep the empty Funtainer in the fridge (with no lid) overnight and fill with milk in the morning where I then pop it in the freezer until it's time to load the backpacks (so about 20 minutes). Works like a charm every time to keep beverages very well chilled! Seriously I want to eat this box myself. 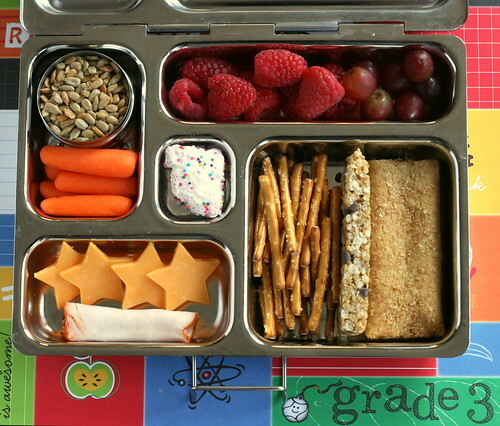 I just ordered a Bento laptop lunch box for my 2nd grader because I cannot stand the thought of her eating school lunch. There are fantastic ideas here on your site. www.justcherishtoday.com - come follow me back - please and lets stay in touch!! Lovely box! I've been searching out boxes as I don't have any yet. Well, I do have the vintage Tupperware bento box. I guess it counts. Does the funtainer fit in the laptop lunch box? two_blue_one_pink - I'm confused by your question. Do you mean does the Funtainer bottle fit in the drink pocket of the PlanetBox lunchbox? It does! Where do I buy the PlanetBox...so cool!! Yes, yes, I would love to get a planet box as well, do you have a full picture of the cotainer???? Hey girls! The PlanetBox is only available on their own website, PlanetBox.com. I love your site and have been inspired to dress up my little man's lunch a bit. I haven't moved up to the fancy bento boxes yet, but it's in the future. I must say -- I am pretty surprised by the quantity of food in the kids' lunches! My 4 year old typically gets a sandwich, yogurt, fruit of some sort and a treat (cookie, yogurt raisins, etc.). 2 granola bars, pretzels, all that fruit, carrots....does your kiddo eat it all??? I used the planet box this year for the first time and I love it! You really can be creative in making healthy lunches! Love your ideas!